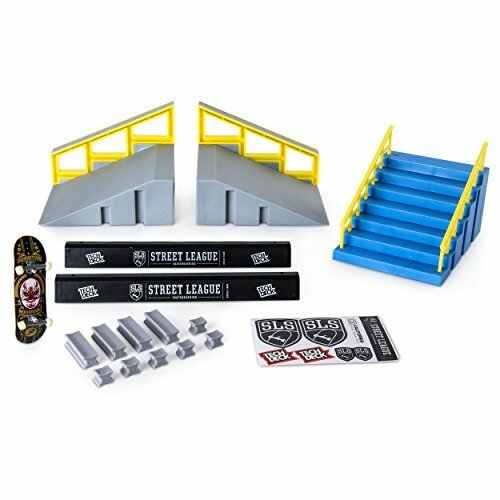 Tech Deck brings you authentic fingerboarding with officially licensed Street League Skateboarding (SLS) ramps and obstacles in the Tech Deck SLS Pro Series Skate Park ramp set with Handrail and Hubba, based on real SLS courses. Use the included signature pro board to grind and slide down the epic hubba or test your speed and see what stunts you can pull on the handrail! As the builder and the skater, you get to customize your ramp using the included stickers and decals. 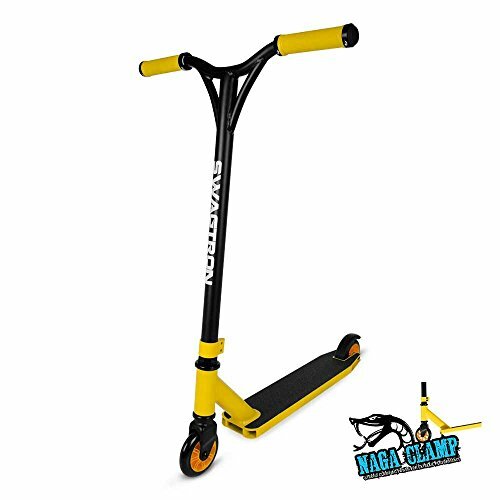 Up the ante and use the additional obstacles included in this set to pull off 360 flips, shuvits and anything else you can think of! 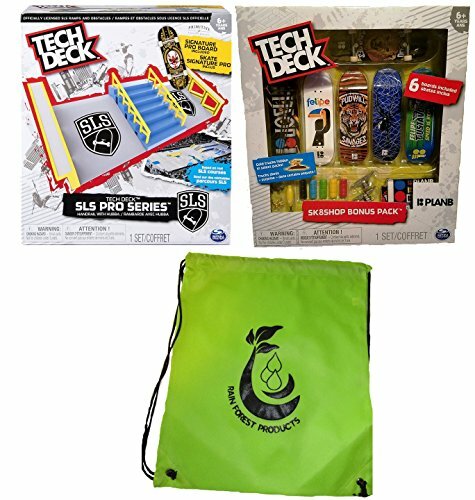 Combine this set with other Tech Deck SLS Pro Series Skate Park sets (each sold separately) to build your own epic SLS course! 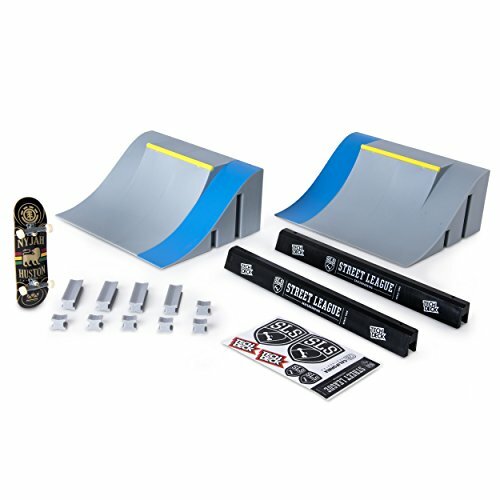 Tech Deck brings you authentic fingerboarding with officially licensed Street League Skateboarding (SLS) ramps and obstacles in the Tech Deck SLS Pro Series Skate Park ramp set with Quarter Pipes with Gap. Based on real SLS courses, this mini version is just like the real deal! Use the included signature pro board to jump the channel gap and see what tricks you can pull, or set up your mini ramp to drop in and slash the lip! Use the rails and barriers to create a totally new course and customize it using the decals and stickers included. 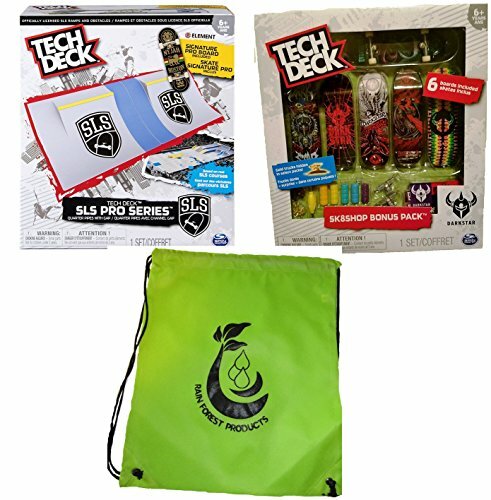 Combine this set with other Tech Deck SLS Pro Series Skate Park sets (each sold separately) to build your own epic SLS course! 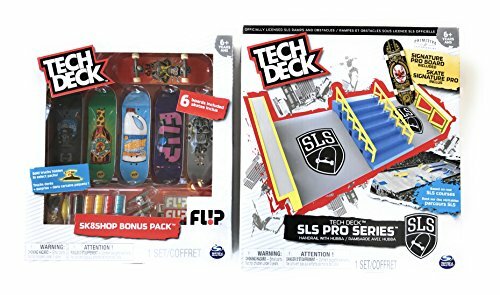 Tech Deck brings you authentic fingerboarding with officially licensed Street League Skateboarding (SLS) ramps and obstacles in the Tech Deck SLS Pro Series Skate Park ramp set with Fun Box and Rail. Based on real SLS courses, this set comes with a fun box, rail and a 96mm signature pro board to master your tricks and fingerboard like a pro! Customise your skate park with the included decals and stickers, and configure your park any way you like. 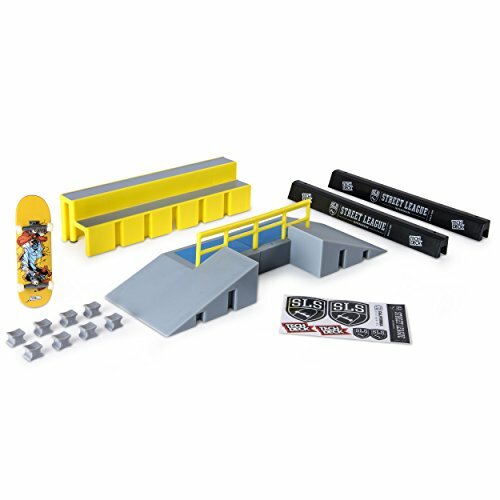 For more action, use the additional obstacles and combine this set with other Tech Deck SLS Pro Series Skate Park sets (each sold separately) to build your own epic SLS course! Sk8shop Bonus Pack includes 6 boards (Style May Vary). Collect the whole series (each sold separately). Build and customize complete boards any way you want. Find the golden trucks hidden in select packs! The Tech Deck SLS Pro Series Skate Park ramp set is based on real SLS courses and features a two quarter pipes with a channel gap with a signature 96mm pro board included for real fingerboarding action! Set up the ramps and obstacles any way you want, and use the included stickers and decals to customise your course. Use the included additional obstacles, and combine with other Tech Deck SLS Pro Series Skate Park sets (each sold separately) to build your own epic SLS course! An assembled Sk8ology Single Deck Display. 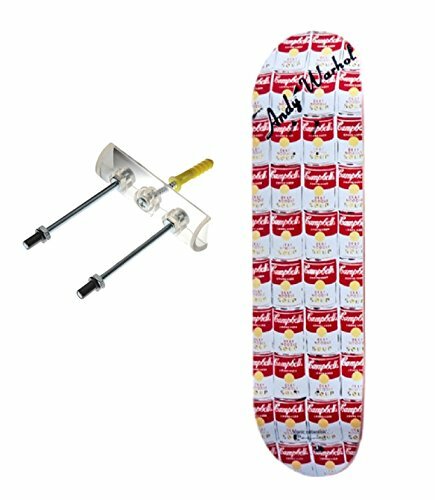 Sk8ology Deck Displays are the original floating gallery display hanger. Made from clear polycarbonite with stainless steel hardware and guaranteed for life. Sk8ology's simple one screw/drywall anchor installation means your walls don't need multiple holes put in them to hang each board. Sk8ology Displays feature two types of installation options - locked or easy on/easy off depending on your individual situation. Sk8ology Deck Displays are the exclusive display of professional skateboarding's top pro's and companies. 100% satisfaction or your money back. Guaranteed. Treat your collectable skateboard decks like the artwork they are. *To hang a board horizontally you will need two Sk8ology Deck Displays. Sk8shop Bonus Pack includes 6 boards (styles vary). Collect the whole series (each sold separately). Build and customize complete boards any way you want. Find the golden trucks hidden in select packs! The Tech Deck SLS Pro Series Skate Park ramp set is based on real SLS courses and features handrails and hubba ledges with a signature 96mm pro board included for real fingerboarding action! Set up the ramps and obstacles any way you want, and use the included stickers and decals to customise your course. Use the included additional obstacles, and combine with other Tech Deck SLS Pro Series Skate Park sets (each sold separately) to build your own epic SLS course! Looking for more Pro Skate Decks similar ideas? Try to explore these searches: Samsonite Steel Folding Chair, Silk Textured Stripe, and Bull Rider Watch. 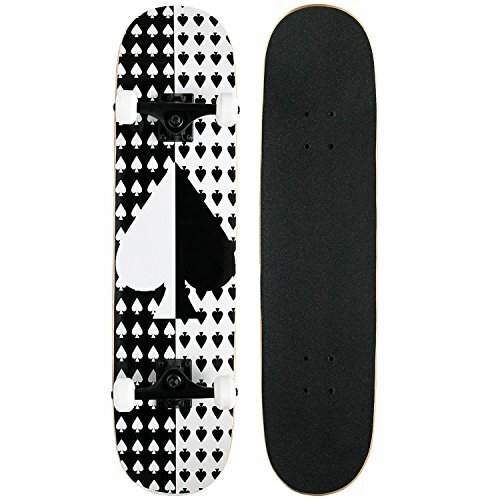 Shopwion.com is the smartest way for comparison shopping: compare prices from most trusted leading online stores for best Pro Skate Decks, Hand Painted Entertainment Center, Bear Stuffed Animal Buddy, Skate Pro Decks . 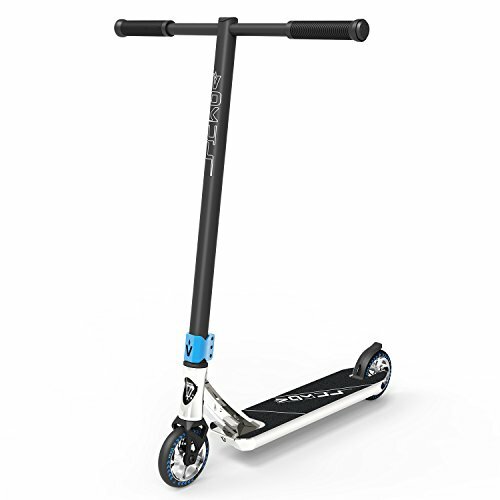 Don't miss this Pro Skate Decks today, April 24, 2019 deals, updated daily.